Almost 15% of the American population has a side hustle and it’s no wonder why. Side hustles provide an extra stream of income, let us pursue our passions, and often lead to learning and development. But how can you find the best side hustle for you? And what questions can you ask in order to figure this out? As I’ve shared in the past, my side hustles are what enabled me to leave my full-time corporate job in January 2017, letting me pursue my own goals and dreams. They gave me the extra income to grow my savings and continue to support my monthly expenses. 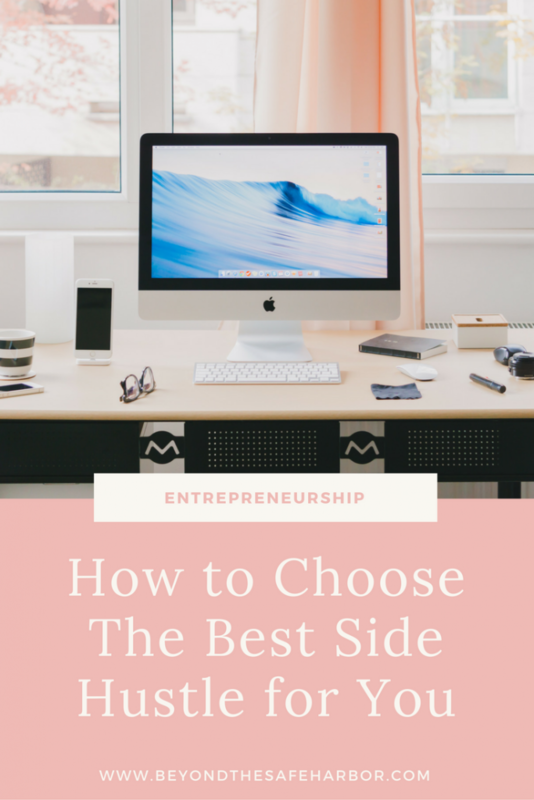 If you’re just starting to consider starting your own side hustle or if you’re looking to refine your additional streams of income, there are several things to take into account. While there’s no one-size-fits-all approach, understanding your situation and objectives will definitely help you make better decisions when it comes to where you focus your energy. Ask yourself these four questions before making your move. First, it’s important to reflect on why you’re considering starting a side hustle in the first place. Is it to earn an extra $200 per month to sock away for a vacation next year? Is it to build a scalable business that will one day let you quit your day job? Those are very different goals and will lead you to different places. In general, the grander your objective, the greater the time investment, at least at the start. That’s not to say that you can’t grow a $200 per month business to a $20,000 per month business, but going in knowing your bigger picture goal will help you decide where to focus your efforts. Second, consider your passion. While making some extra money can be worthwhile in and of itself, the best work doesn’t feel like work and choosing to monetize a passion or at least do something you enjoy will greatly increase your chances of success. My video about how to find your passion is a good starting point for zeroing in on where your passions lie. It covers questions to ask yourself and ways to uncover hidden passions. I recommend not only looking at how you typically spend your free time, but what types of details and environments bring you joy. For example, do you love volunteering with kids? What about it do you like? Is it the impact you’re able to have on others? What is it about that impact? Does it combine multiple strengths of yours? What are those strengths? What is it about you that makes you uniquely poised to be a great volunteer? Once you’ve identified your passions, you can use them to brainstorm potential side hustles. If you’re passionate about volunteering with kids because you’re great at presenting, engaging with kids, teaching them, and delivering complicated information in a simple way, maybe group tutoring or teaching would be a way to monetize this passion and capitalize on your strengths. When will you work on your side hustle? This question involves both when you’ll do the majority of the work as well as how much time you’ll carve out. If you work a 9-5 office job, starting an Etsy shop where you fulfill orders in the evenings and on weekends is pretty viable. Working as a virtual assistant, however, may not be if the entrepreneurs you work with require you to be available during the work day. Likewise, if you work 80-hour weeks and only have one free weekend per month available for a side hustle, writing an eBook may make sense. Running your own multi-level-marketing business (like selling Arbonne or Mary Kay products) may not be if you’re not available to meet potential customers, present at parties, or attend calls. Along with understanding the time you’ll be dedicating to your side hustle, give some thought to the lifestyle you want. Love to travel? Running an online retail store may be challenging if you’re the one shipping out orders. Looking to take time off from your business? A side hustle with passive income may be more up your alley. Before starting a side hustle, it’s wise to give yourself a minimum time commitment before reassessing. Starting something new can be overwhelming, and it’s easy to get discouraged. To maximize your chances of success, give yourself at least 6 months to try it out and see how it goes. And check out these ideas for side hustles you can start while working full time and an additional 30 ways to earn extra cash on the side. Starting a side hustle is an exciting step and one that shouldn’t be taken lightly. With answers to these questions in mind, you’ll be in great shape to choose the right endeavour for your needs. Looking for tools to help you grow your business? Check out 10 of the Best Online Business Tools for Managing Your Side Hustle. And be sure to read 3 Mistakes to Avoid When Starting Your Own Business to set yourself up for success.